Paul Wilson has been hospitalised 48 times as a result of his asthma - and he has had to be resuscitated on 25 occasions. 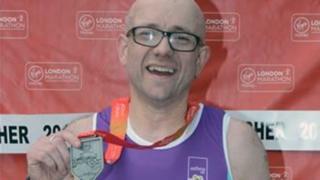 But last year the 44-year-old from Beith, North Ayrshire, managed to run the London Marathon. He says his health improved markedly after a vital appointment with an asthma nurse about his inhaler. Now he is backing a new campaign urging others to use their medication properly. Experts say more than a million people in the UK could be at risk of a life-threatening asthma attack as they do not get their inhaler technique checked. Mr Wilson admits he missed out on vital inhaler technique checks with his GP as he did not attend his annual asthma reviews. He said: "I've been rushed to hospital countless times with my asthma, and been put on drips, nebulisers, and even ended up in intensive care. "But I'd never really given too much thought on how to manage my asthma or use my inhaler properly. "Looking back, I was just taking a puff and hoping for the best." The consequences of his poor technique could have proved fatal. He added: "My symptoms were getting so severe that it got to the point where I was having an asthma attack every week. "I would wake up in the middle of the night gasping for breath and it felt like someone was sitting on my chest." The results of an appointment with his asthma nurse to review his medication were startling. Mr Wilson recalled: "They said the way I was using my inhaler meant that only 10-20% of the medicine was getting into my lungs. "They showed me the correct inhaler technique and gave me a spacer to use, and the difference it has made to my asthma is incredible. "I even ran the London Marathon for Asthma UK last year. "I never thought that something so simple could completely turn my life around." An Asthma UK report found nearly one in five (19%) people are not getting their inhaler technique checked. The charity said research also shows that almost half of people with asthma are not using their inhaler properly, often without realising. This means the full dose of medicine cannot get into their lungs where it is needed to protect them from a life-threatening asthma attack. Instead the medicine stays in their mouth or the back of their throat, which can also make people more likely to experience side effects such as oral thrush and a sore throat. According to national guidelines, everyone with asthma should get their inhaler technique checked as part of their yearly asthma review with their GP or asthma nurse. The charity has also launched videos on its website which demonstrate how to use more than 21 different inhalers, spacers or nasal sprays including pMDI, Turbohaler and HandiHaler. It is also urging patients and parents of children with asthma to attend their asthma reviews and watch the videos with their GP or asthma nurse so they can be mindful of how to use their inhaler properly. Common mistakes include breathing too forcefully or not forcefully enough, not breathing in deeply enough, or not preparing their inhaler properly, such as shaking it before use. Dr Andy Whittamore, clinical lead at Asthma UK, said: "Inhalers are the bread-and-butter treatment for most people with asthma, so it's really worrying that many people are not taking them properly, or getting their technique checked by their GP or asthma nurse. "With so many different types of inhaler which are all used in different ways, it can be difficult for patients and healthcare professionals to know the correct way to use them. "It's also easy for patients to get into bad habits or simply forget the best technique following their appointment, especially if they have a new type of inhaler. "But even a small tweak to how someone uses their inhaler can make a huge difference and could prevent them having a life-threatening asthma attack."